Unsurpassed by any other---The SmileStudio Team, a SW Florida Cosmetic Dental Team serving Fort Myers, Cape Coral, & Naples, FL, takes great pride in being as professional as they are fun! They work very hard to ensure that each patient visit---whether it be for a Cosmetic Teeth Whitening procedure or for a Complete Customized Cosmetic Smile MakeOver---is a comfortable and pleasant experience while teaming with Cosmetic Dentist* Dr Ron Drachenberg to provide the ultimate in dental care. For a small glimpse into The SmileStudio experience---See The SmileStudio SuccessStories . . .
A Lifetime Of Beautiful Smiles! 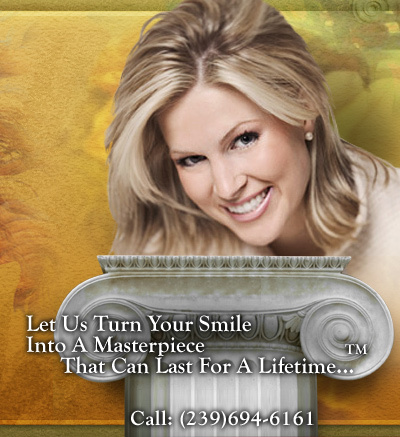 "Let Us Turn Your Smile Into A Masterpiece That Can Last For A Lifetime!"